"Some eighty years ago, in the mountains of Taiwan, two races clashed in defense of their faiths. One race believed in rainbows, the other believed in the sun. Neither side realized that they both believed in the same sky." Despite its lovely lyricism, the above quote doesn't appear anywhere in the film Warriors of the Rainbow: Seediq Bale. It is, in fact, the short synopsis from the film's press notes. Whoever wrote those press notes should be commended, because they wrote a three sentence synopsis that's better than the 2.5 hour film it describes. If only the film itself had contained even half of that same poetic depth then it would have truly been something to treasure. There are glimmers of that potential here and there, but that's mostly all Warriors of the Rainbow is - potential. It has all the makings of a thundering epic, a kind of Braveheart meets The Mission, but the end result feels like director Wei Te-sheng threw all the right ingredients into a bowl, but forgot to mix them together. The final product is a disjointed collection of cliches and ideas that never jell together into a cohesive whole. Based on a rather obscure piece of Taiwan's history (little known even in Taiwan), Warriors of the Rainbow: Seediq Bale is the tale of the aboriginal Seediq tribe, which came under the rule of the Japanese when Taiwan was ceded by China in 1895. For over 30 years the island of Taiwan was under brutal Japanese rule, until Mouna Rudo, a chief of the Seediqs, united the tribes and led his people in a revolt against the far superior and more advanced forces of the Japanese. Rudo, a warrior who strictly adhered to the ancient teachings and beliefs of his people, has long accepted the rule of the Japanese with a brooding resign, resentment boiling beneath the surface but wisdom staying his hand. But when the oppression becomes too much to bear, he begins to reflect on the potential lost souls of the young members of his tribe whose hands have never known battle and whose faces remain unadorned with the traditional tattoos signifying manhood. It soon becomes clear that the only way to save their souls is to give up their lives. Hopelessly outmatched and out gunned, Rudo leads his people into battle, fighting not for freedom, but for eternity. Da Ching in Wei Te-Sheng’s WARRIORS OF THE RAINBOW: SEEDIQ BALE. It's all very familiar, as we've seen endless variations on this story before. But its truth lends a certain amount of interest that sets it apart somewhat. The biggest problem with Warriors of the Rainbow is that it feels just like all the other advanced empire versus scrappy natives films. At 2.5 hours long it's a bit of a slog, but it's beautifully filmed, and features some undeniably stirring moments. I only wish they weren't so few and far between. It also raises some inevitable questions about the allegiances it expects us to feel, when the Seediqs are actually just as brutal if not more so than the Japanese. Heads roll in this film frequently, flying through the air, rolling on the ground, always accompanied by spurting arterial sprays. We are automatically supposed to root for the Seediqs because they are the underdogs and pull against the Japanese because they are the occupiers. But when we play witness to the heroes chopping off head after head in the most brutal fashion, it becomes hard to accept them as the group to feel sympathy for. Wei just doesn't spend enough time developing the history between these two peoples. Without the back story to provide some answers, it's almost easy to see why the Japanese were so disgusted by the Seediqs - they were every bit as brutal as the propaganda claimed (if the film is to be believed). Despite the film's ideological slippery slope, for his part, Lin Ching-Tai is excellent as Mouna Rudo. The non-professional actor simply exudes wisdom and courage, and he beings an anchoring quality to a film that often gets lost ferreting off on its own tangents. Beautiful cinematography can't mask a weak script, and despite some thrilling action sequences and moments of searing emotion, the script just doesn't do the story any justice. 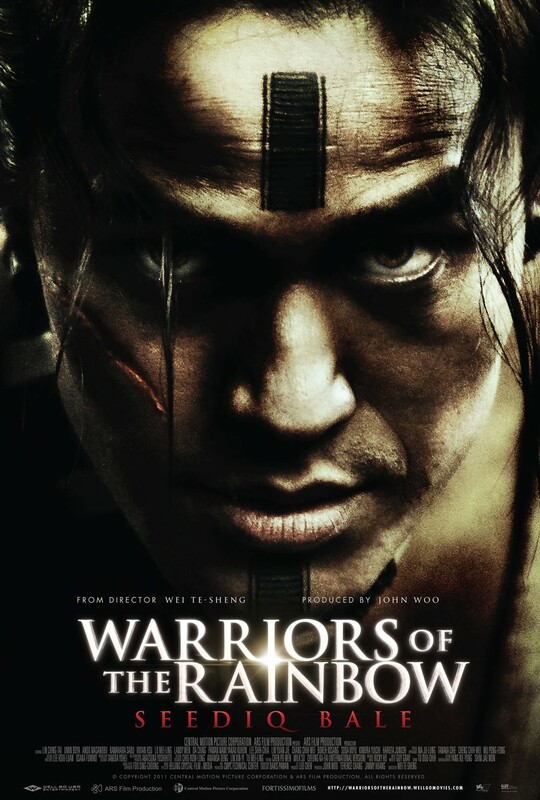 While Warriors of the Rainbow may have been a passion project for Wei that was years in the making, it never becomes the film one knows it can be. 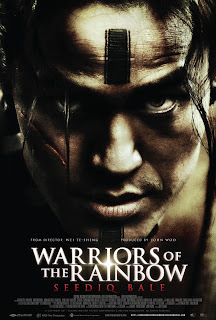 WARRIORS OF THE RAINBOW: SEEDIQ BALE | Directed by Wei Te-Sheng | Stars Ling Ching-Tai, Umin Boya, Ando Masanobu | Not rated | In Seediq w/English subtitles | Now playing in select cities. Are you serious? How can you not root for the 'savages'. how would you feel if foreigners came to your land and you were living happily off the land, they then built schools and enslaved you paying you next to nothing and making you alcoholic. A culture was destroyed by the japenese and that's what the movie is trying to show. You have missed the whole point of the story. show some empathy! Empathy isn't the problem here. My problem is that both sides seemed equally brutal. But that still takes a back seat to the fact that the film is stiff and overlong.